Through personal page on the social network, one can track his solar energy generation and measure the amount of carbon offset created by the solar electricity. According to Hans Raffauf, head of communications at Changers, it also offers some common features: social network allows you to exchange experience with neighbors, friends or people from other countries. Data is stored and shown in your profile page on the website. The energy is measured in watt-hours and converted into special credits. The energy-to-money conversion rate differs depending on the retailers. Credits can be used to buy new devices from online shops. 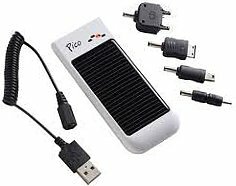 Solar powered cell phone chargers offered by Changers generate 4 watts per hour. The battery can hold up to 16 watts, which is enough for two iPhones. You can easily charge up the battery in the daytime and transfer the energy to your devices - tablets, cell phones or other gadgets - at night. So far the majority of high-tech companies have failed in getting their customers to be mindful of energy use and conserve. Changers may be the game-changer. But it won’t happen until new social network will build up a large user base to attract more retailers. We'll see about that.